Using Skype on your TV is kinda neat: it opens the conversation right up and makes group chats more fun. 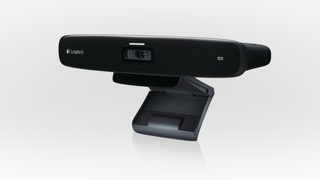 Now Skype and Logitech have announced a new TV-mounted camera that lets you do that conveniently—for a price. The TV Cam HD is compatible with any HDMI-equipped TV, and can use either Wi-Fi or ethernet to hook up to the internet. The device is pre-loaded with Skype—running on what we're not quite sure—so you can just use it to log in to your existing account and make video calls, or proper phone calls using credit. The thing rings when your TV is on or off—which is either a curse or a blessing, depending on your view—and has a zoom feature which may be useful if you're sat on the sofa by yourself. It also claims to work well in low-light conditions, but some real-life experience is probably needed before that claim is believed. If you feel like you've seen something like this before, then that's because you probably have. The TelyHD offers a very similar concept, but retails at $250.